Home→Introduction to Ayurveda→Who are you? If you approach people on the street with such a question, then there will be no limit to the variety of answers. I am John Smith; I’m a girl; I’m an engineer; I am a father; I’m an old man; I’m a liberal; I’m a human. All these answers will be true, but not absolutely true. An absolute truth is something that is always true, regardless of time, place, and circumstances. For example, Sacramento is the capital of California – it’s true. However, there was a time when it wasn’t and no one can guarantee that it will still be the capital in a thousand years. Similarly, all the definitions that we assign to ourselves are a small, temporary, private truth. Throughout life, we change names, professions, social and family statuses, age, appearance and even our convictions. Eventually, with the death of the physical body, all these names of which we were proud – or, on the contrary, ashamed — become meaningless and do not bother anyone. However, the ancient scriptures say that along with this relative, temporal truth there is an absolute truth that has always been, is and will be. This is how it is described in the Vedic book Bhagavad Gita (Song of God). In the 16th chapter of the second song, it is said: “Those who are seers of the truth have concluded that of the nonexistent there is no endurance, and of the existent, there is no cessation. This seers have concluded by studying the nature of both”. Therefore, in addition to visible volatile material characteristics, there is something unchanged, albeit invisible. The good news is that it has already been researched and described in the scriptures. For the curious, an account of the dimensions of the soul, its location in the body, how and why it enters the material world, and how it interacts with it is given. It turns out that the soul has wonderful properties: it is indestructible, eternal, unchanging, and primordial. The three main qualities of the soul are eternity, knowledge, and bliss – all of the things that we are constantly looking for in this world but cannot find. How can we utilize this knowledge about our eternal nature? It is probably worth starting with a reassessment of values. If all living beings are eternal, then perhaps, begin reducing the tempo of rat races in order to acquire temporary things that are doomed to be lost? Or maybe, pay attention to the eternal soul next to me and try to understand why fate has brought us together here and now? So many great things can be done; and even a chance to correct past mistakes is not excluded. After all, eternity lies ahead. Please notice that this is not a boring, impersonal non-being, where we will remain in eternal oblivion. No, this is a wonderful, active spiritual world, which in fact is much more real than the material one. This is also described in detail in the Vedic scriptures: what kind of world is it, what living beings are doing there and how to go back home. Our business is to study this knowledge and apply it in practice. As it says in “The Song of God” 9:2 “This knowledge is the king of education, the most secret of all secrets. It is the purest knowledge, and because it gives direct perception of the self by realization, it is the perfection of religion. It is everlasting, and it is joyfully performed”. I would try to answer the question: who am I and why I am here if you are genially interested in answer? Yes, please. I am looking forward to hearing your answer. Are all living beings eternal? Where might I find this information about where my soul is in my body. Thank you btw for your wonderfully helpful article on Spice Therapy, Six Tastes. Very clear concise! 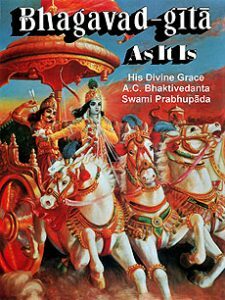 Bhagadad Gita as it is.